This is my favourite recipe for No Bake Cheesecake and comes from the first cookbook our church published years ago. Credit goes to Yvonne W. who submitted it. 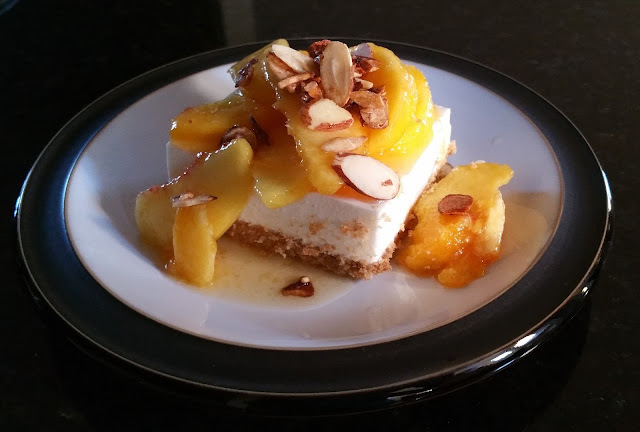 I made this using fresh peaches, but you can substitute whatever fruit is in season to top the cheesecake. Place almonds and sugar in a frying pan over medium heat. Spread out almonds on a sheet of waxed paper and allow to cool. In a mixing bowl, combine graham wafer crumbs, 1/4 cup sugar and melted butter. Press into a 9" x 13" glass pan. Refrigerate while you make the filling. Beat the cream cheese and sugar in a large bowl until light and fluffy. Add milk and mix again, scraping sides of bowl. Dissolve gelatin in cold water and warm on stove until dissolved. Add to cream cheese mixture and mix well. Chill mixture in refrigerator until thickened, stirring every 5 minutes, until slightly thickened. Fold gently into cream cheese/gelatin mixture. Spread over crumb base and refrigerate until set. When ready to serve, peel and slice peaches adding a tablespoon or 2 of sugar if desired. Spoon peaches over cheesecake and sprinkle with a tablespoon or so of the candied almonds. Note - When I made this to take to a party a while ago, I forgot to add the milk. The cheesecake turned out just fine, However it was not quite as light as the next time when I remembered to add the milk! This sounds lovely. Is it 1/2 or 1 1/2 cup whipping cream? Thank you for seeing that error. I have corrected it and the slash in is the right place now! it is 1 1/2 cups whipping cream. Oh Bev - this looks delicious!!! It's peach season over here. You picture of this is fantastic. I've been looking for a no bake cheese cake recipe suitable for a variety of fruits. About the whipping cream--would half and half work ok too, for a little less richness/calories/fat? Half and Half will not whip like whipping cream does, so I wouldn't recommend using it. I think the milk tha's mixed with the cream cheese lightens the heavy cream though.